Heat oven to 400 degrees. Thaw folded pastry sheet for 20 minutes. Open sheet and cut along folds to make three equal strips; halve each strip to make six rectangles. Space apart on baking sheet. Bake in center of oven about 15 minutes until well browned and baked through. Remove to rack to cool. Carefully split each piece of pastry in half horizontally. Cover bottom halves with almonds, then pudding mixture and sliced strawberries, dividing equally. Cover with pastry tops. Dust with powdered sugar. 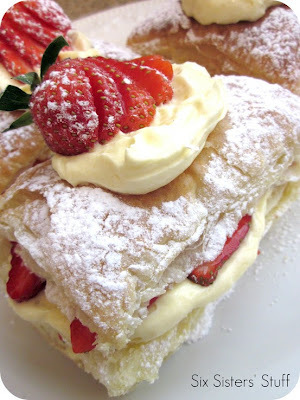 *You could double the pudding mixture and use both sheets of puff pastry for more Napoleons. I ended up using all of my puff pastry to be able to have additional layers for each Napoleon.